There has been a bit of information floating around the internet about DeWalt's new plunging track saws. This is somewhat big news for the building community because DeWalt is the first of the well known US companies to offer such a saw. 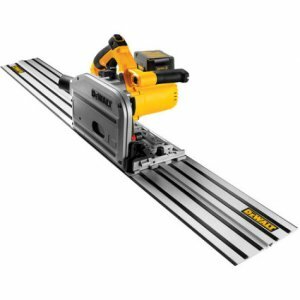 From what I understand, these types of saws are really popular in Europe, but DeWalt is hoping to make a showing in the US. Festool is another brand that offers a plunging rail saw, but they are not as well known to your average builder or woodworker. DeWalt will be offering both a corded and 28 volt cordless version of the saw, and both will feature a dust port that you can connect you vac/dust collector to. They will offer 3 different size rails to fit your needs, a 48" 59" and 102" and also offer a connection kit to join rails together to make them even longer. They same rail system can also be used on DeWalt routers, with a rail attachment. Another great addition, is the anti-kickback feature. When engaged it will prevent the saw from kicking back while in the rail. This will not only save your wood and rail from the kickback cut, but it is also a great safety feature to save your much loved body parts. The corded saw is expected to cost between $500-$700, and the cordless between $700-$900. Both saws will launch at the end of October. The corded version cost around the same price as the Festool versions. You can see a video of the saw in action on the DeWalt UK site. The UK site also lists an 18 volt version; we will have to wait and see if it will be available in the US. Review your DeWalt Track Saws at Tool-Rank.